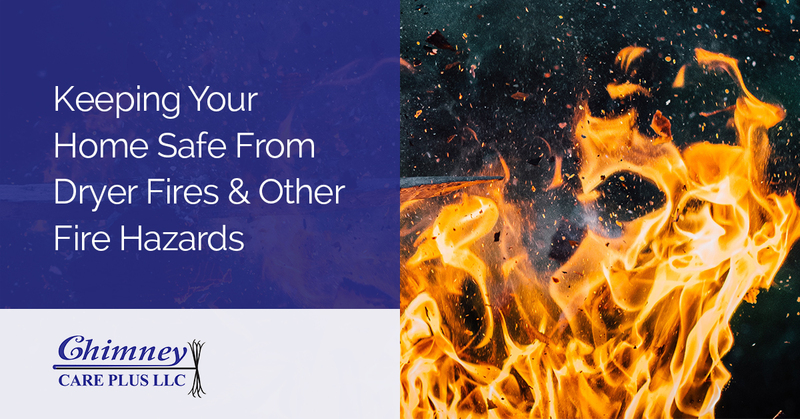 Whether or not you own a fireplace, your home still comes with its own set of fire hazards. Make sure that you know how to handle the worst of these hazards through proper home maintenance and other preventive measures. As your chimney and dryer vent specialists, we can assist you with keeping your home a safe haven for you and your family. If you have any questions about how a chimney sweeper from our team can assist you with home fire safety, please reach out to our team today. We can assist you with everything from chimney repairs to dryer vent cleaning in Frederick and surrounding areas. 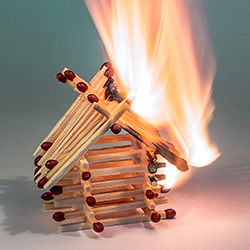 Read on to learn more about the best fire safety tips and tricks for your home. Most of us dry our clothes every week without much thought about the machine we throw them into. Unless your dryer stops working, it is probably a household staple that you rarely spend any time worrying about. Unfortunately, due to the high heat of dryers and the buildup of lint in dryer vents, your dryer can potentially be one of the most dangerous fire hazards in your home. Once upon a time, dryers were always located near the outside wall of a home, which meant dryer vents were very short and usually straight. However, with the modern designs of homes, dryers can be found in any room in the house, as far away from an outside wall as one wants. In this case, the dryer has a long vent, which often bends and winds throughout the home’s walls. Inside those vents is where trouble can begin. Over time, lint can build up inside the dryer vents, getting stuck on corners and bends. Not only can lint and debris from your clothing buildup in dryer vents, improperly sealed vents can allow access for rodents and other critters. These animals will build nests in your dryer vents, creating a large clog in the system. A good indication that your dryer vents are in need of cleaning is the inefficient operation of your dryer. When it takes multiple cycles to dry your clothes, it could be due to a clogged dryer vent. When your dryer vents are filled full of lint and debris, they are essentially a tinderbox waiting to go up in flames. Remedy the situation by scheduling dryer vent cleaning services. Here at Chimney Care Plus, one of our specialties is in ensuring your dryer vents are free of debris. One of the best ways to ensure your home is safe is by always keeping an eye on any fire you intentionally start. For example, while you may enjoy the smell of your home after burning a variety of candles, you should never leave burning candles unattended while you are away. Only burn candles, incense, and other such items when you are in the same room and can keep an eye on the flame. This is particularly true if you have children or pets in the home. One candle knocked over can lead to a raging blaze. If you own a fireplace or wood-burning stove, always make sure the fire is put out completely before you leave your home. Even though your fireplace is designed to keep a fire safely inside of its structure, logs can shift and embers can spark through the air. Keep an eye on any fire you build to ensure the safety of your home. In homes that have a stove with gas burners, it is important to also keep your eye on the flame. Even if you are running a short errand, it is never wise to leave a burner of any kind operating while you are away. Not only can an unattended flame cause a fire, cooking, in general, is one of the leading causes of home fires. Make sure that anytime you are cooking you keep the stovetop and oven free of any flammable debris. Also keep in mind that while sipping on wine when cooking sounds like a great idea, too much alcohol consumption can lead to forgotten stovetops or ovens. Make sure you always double check that your burners and oven are turned off before you call it a night. If you want to keep your home safe from dryer vent fires, talk to our team about scheduling dryer vent cleaning services today. Not only do we provide outstanding chimney sweep services, we also are CSIA Certified Dryer Exhaust Duct Technicians. We will clean your dryer vents and free them from any obstructions, as well as inspect the vent system to ensure it is installed properly. If you have any concerns about your dryer vents, please give us a call today at 301-969-4114. We look forward to assisting you keeping your home safe from fires.